The Soundwave Pep Band performs, entertains, and rallies at Tulane Green Wave Volleyball, Men's Basketball, and Women's Basketball games in the Avron B. Fogelman Arena and travels with the team to the American Athletic Conference and NCAA Tournaments with the Men's and Women's Basketball teams. Membership in Soundwave is open to anyone! Follow Soundwave on Social Media @tulanesoundwave! 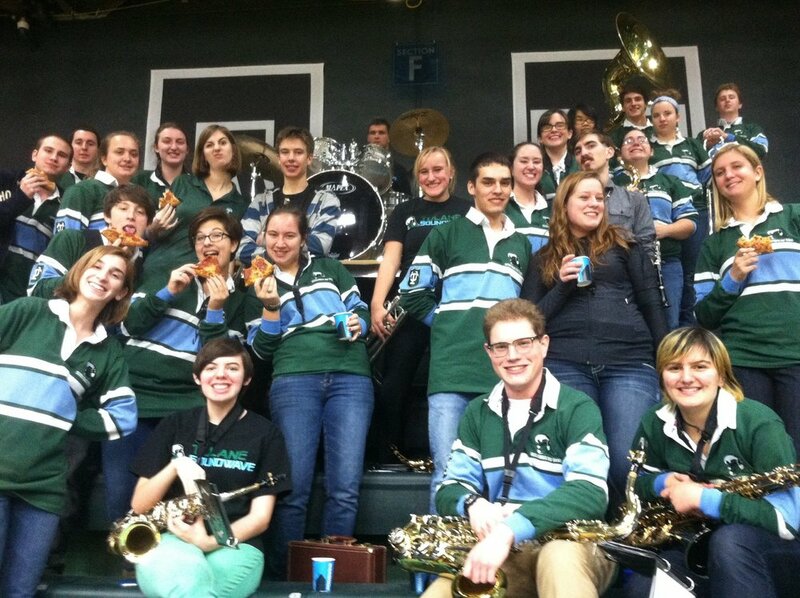 SOUNDWAVE Pep Band was founded in 1992, four years after the Tulane Athletics Department reinstated men's basketball and hired Coach Perry Clark to reignite the program. By 1992, the men's basketball team had achieved a record of 22-9 and a national ranking, inspiring tremendous school spirit at Tulane. Fans of "The Posse" filled Fogelman Arena for each game, and lines of fans wanting tickets stretched around the stadium, making it nearly impossible for students to find seats. This prompted a young group of student basketball enthusiasts with musical abilities to form a student organization to perform at the games, guaranteeing them a seat in Fogelman. The plan was a success, and Soundwave has grown in each subsequent year. For more than a decade, Soundwave has provided music and entertainment for every home basketball game (outside of university holidays), pep rallies, and other Tulane events. Over the years, Soundwave has traveled to, and performed at, Conference USA, NIT and NCAA basketball tournaments in places such as Louisville, Kentucky; Memphis, Tennessee; Lubbock, Texas; Milwaukee, Wisconsin; Ames, Iowa; Palo Alto, California; Birmingham, Alabama; Durham, North Carolina; and Cincinnati, Ohio. Following a decade of steady growth in membership, increased donations, and improved student leadership, April of 2002 saw a significant development in the history of Soundwave: a return to the Superdome. On April 9, 2002, thirty Soundwave members performed atthe Tulane - LSU baseball game, a game which shattered previous college baseball attendance records. Inspired by the success of the performance and adulation of fans, Soundwave performed in the stands of the Superdome at the Tulane home football games the following fall. Following the success of Soundwave's revival of the Tulane University Marching Band, the Newcomb Department of Music at Tulane University adopted the marching band, authorized it as a credit course, and hired Mr. Barry Spanier as Director of Bands. Soundwave donated the percussion equipment and other marching band supplies that had been purchased through generous donations from alumni and other Tulane fans. In addition, the funds raised for the purchase of marching band uniforms that student leaders had designed during the previous marching season were donated to the Music Department to aid the transition of the band from Soundwave's control and to benefit the future members of the group.One of Soundwave's greatest accomplishments was achieved with the revival of the Tulane University Marching Band in the fall of 2003. The Tulane University Marching Band ("The Spirit of New Orleans"), directed by students and comprised of sixty students, alumni, and community volunteers, debuted in the Homecoming parade at Tad Gormley Stadium on October 11, 2003. The band performed at the final three home football games that season, including the Homecoming game and two games at the Louisiana Superdome. In addition to a tailgate show and parade for fans, the group also performed a pre-game and halftime show at each football game. To end the historic year, the Tulane University Marching Band marched in its first Mardi Gras parade, Le Krewe D'Etat, on February 20, 2004. In the aftermath of this accomplishment, Soundwave has returned to its defined mission as the pep band of Tulane University, performing at home basketball and volleyball games, tournaments, and other Tulane events. With Tulane's admission into the newly formed American Athletic Conference for the 2014-15 season, Soundwave looked to be prominently featured as a part of the University's increased television schedule for the Men's Basketball team, and were. With growing numbers and television time, both Soundwave and the TUMB experienced a shift in both popularity and intensity as the demand for the Spirit of New Orleans grew larger.